22.5 inch tall closed. 32.5 inches tall open. Discover the freedom of easy entertaining. The Cool Bar is a cooler, cocktail table and coffee table all in one; your ultimate 3-in-1 backyard, garden and patio accessory. 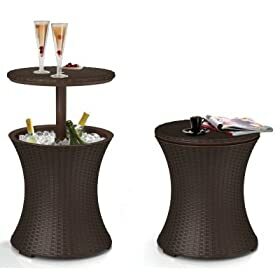 It's designed with an extendable tabletop, transforming from a contemporary coffee table into a sleek cocktail table in one simple twist! For barbeques, deck parties or just lounging by the pool; enjoy a perfectly chilled drink right at your fingertips.